My Little Farmies - Tycoon Games - Play for free now! What an enchanting view! Slowly the majestic flour mill's sails are turning in the wind. Your gaze passes over the luscious rye and wheat fields that are ready for harvesting. On the pathways crossing the fields, you watch the farmies ambling by - men and women dressed in medieval garments. The entertaining tycoon game My Little Farmies lets you develop your very own virtual village community. You take care of your farm's agriculture by planting cereal, fruits, trees and vegetables, and process your yield in various production buildings - from flour mill to juice press or dairy. My Little Farmies offers you a multitude of features and functions - plus, the farm-game is absolutely fun to play! Experience the mesmerizing world of farm and tycoon games and play along now! The colorful browser game My Little Farmies lets you develop your own village community. 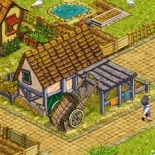 Here, you'll turn a green meadow into a prosperous village: the agricultural simulation lets you place production buildings, plant rye, wheat, fruit trees and harvest plums, apples and further produce. Raise cows, geese, rabbits and sell them to your customers. The farm game has got all a truly exceptional tycoon game needs. 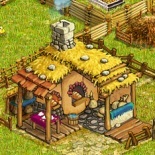 And, it's you who will decide which twists and turns this village's story will take, for it is you yourselves, who'll determine which products you'd like to specialize on to earn farm-thalers, where exactly you'd like to place new buildings, and which items you'll use to embellish your grounds in this farm-game. 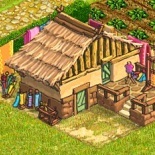 Make sure to operate economically, and you'll soon turn your small hamlet into a prospering village. Sign up on MyLittleFarmies and discover the colorful world of "farmies" and join in for free now! What is My Little Farmies? My Little Farmies offers is a true gem among tycoon browser games. For here, you'll be able to create your own world, plan and decorate an entire village entirely based on your own ideas. You tend to the fields, plant cereal, fruits and vegetables, breed animals, place production buildings - from flour mill to sowing mill or tailor shop, in which you'll be able to process your produce, and place pathways. Farmies love pretty farms - so make sure to plan your farm carefully, for the prettier your farm, the higher the amount of farmies that will frequent your paths in this tycoon game. Farmies are men and women that will busily bustle through your village. Its medieval setting makes the farmies game especially charming. 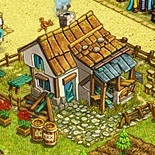 Discover the amazing world of tycoon games on My Little Farmies and play along now!